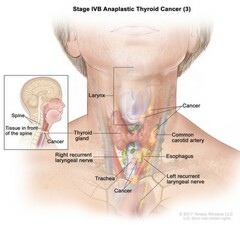 Stage IVB anaplastic thyroid cancer (3); drawing shows cancer in the thyroid gland and in the esophagus, the trachea, the larynx, the left recurrent laryngeal nerve, and the tissue in front of the spine (inset). Cancer has also surrounded the common carotid artery and the blood vessels in the area between the lungs. Also shown is the right recurrent laryngeal nerve.